Lawmakers have provided PG&E a lifeline, but that's not enough to change the long-term risks facing the California utility. Utilities are supposed to be boring dividend-paying stocks that income investors can rely on in good times and bad. On the surface, California utility PG&E Corporation (NYSE:PCG) seemed to conform to that model. But events in 2017 quickly proved that PG&E was not, in fact, as safe as it seemed. And while California lawmakers have tried to curtail the damage with the passage of Senate Bill 901, this new law isn't enough to change the big-picture risk here. Here's what you need to know. California is a giant, wealthy state driven by technology innovation. At first glance, it would appear to be a pretty good state in which to operate for an electric utility, even though California tends to lead the nation when it comes to environmental regulation. Only there's another, increasingly important issue: California also tends to be a very dry state. This isn't new information. However, the state has been dealing with severe water shortages for several years, increasing the risk of wildfires. Once a fire gets going, it can be very difficult to contain, and as the news headlines often show, property and lives are lost before things are brought under control. 2017 was a particularly bad year for wildfires and PG&E. Cal Fire, the state's fire management agency, recently placed the blame for a dozen 2017 wildfires, 18 deaths, and hundreds of square miles of fire damages on PG&E. There were more fires that involved the company beyond those, as well. Essentially, sparks from its overhead power lines were deemed responsible for starting the wildfires. That potentially left the utility on the hook for the impact of the fires. And it could be pretty bad: The company took a $1.6 billion charge (roughly $3.07 a share) in just one quarter because of the potential liabilities associated with past wildfires. That charge left the company with a loss of $1.91 per share in 2018's second quarter. The utility eliminated its dividend in late 2017 to preserve cash because of the potential liability related to the fires. The savings from that move weren't nearly enough, and the company warned that the costs of the fires could push it into bankruptcy following the announcement by Cal Fire. Seeking to avoid such an outcome, the state's government drafted a bill, SB 901, that would, effectively, allow PG&E to shift wildfire-related costs to its customers. In a nutshell, the state would issue bonds that PG&E would pay off by charging customers -- but only for fires where it was determined that PG&E acted responsibly. If PG&E is deemed to have not acted in a responsible manner, then the company, and thus its shareholders, would be on the hook for all associated costs. The new law is, without a doubt, a lifeline for PG&E. Without it, the utility would almost certainly have had to go into bankruptcy in an attempt to deal with the wildfire costs. Understandably, the stock moved steadily higher as the bill moved through the approval process and was, eventually, signed into law by the governor. The stock even received analyst upgrades because of SB 901. For long-term investors, though, this new rule doesn't actually change the dynamics enough to make PG&E a worthwhile risk. First off, fires are still a big issue for California and PG&E. The only way to really change that is for Mother Nature to turn the historically dry state into a wet one. In other words, PG&E will be facing wildfire issues well into the future. Which means the company, and its investors, need to come to grips with what it means to deal with wildfire risks responsibly. To provide an example of the complexity of this issue, PG&E recently shut down power to around 87,000 customers across 12 counties in a pre-emptive attempt to avoid wildfire risks. In fact, it appears that SB 901 specifically requires such actions. But there's a cost to moves like this, including shutting down power, bringing it back up again, and the lost revenue while the power is out. And since there's no way to tell if shutting the power down actually prevented a wildfire, PG&E is likely to start seeing pushback from customers when it makes such decisions in the future if the bill is successful at reducing the overall number of wildfire events. From a business perspective, PG&E is in a horrible catch-22. Yes, the new law should make things better. But it doesn't solve the problem, which is a function of the natural environment in which the utility operates. Stepping back and looking at this issue from a distance, it is clear that there are much better options in the utility space for investors. These include far more boring utilities like Duke Energy and companies with unique characteristics like PPL Corp. that might interest a special-situations investor. 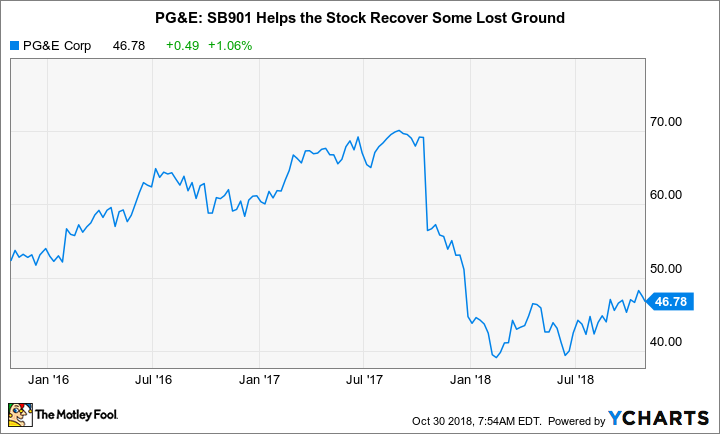 But in the end, SB 901 doesn't change the risk-reward situation enough at PG&E to make it worth buying.